What are Malaria and Dengue? 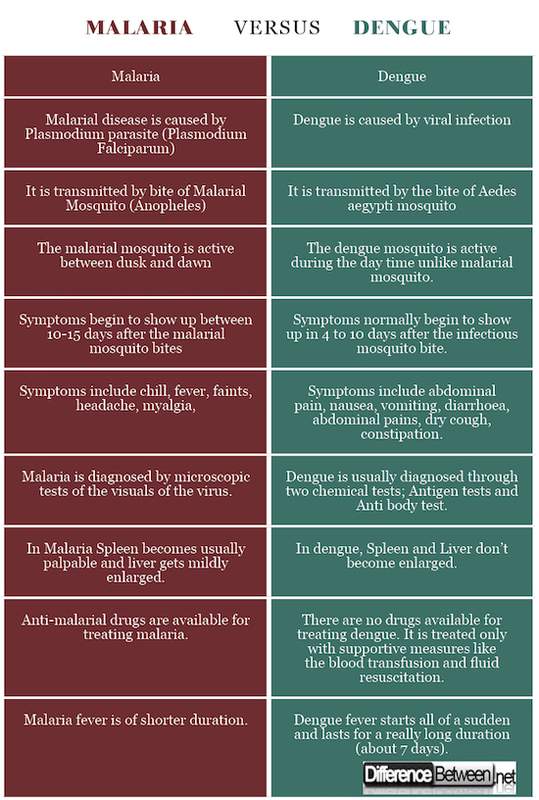 Both Malaria and Dengue are mosquito borne diseases. These two infections are common in tropical and subtropical regions and cause high morbidity and mortality for many patients around the world. It is an infectious disease caused by a protozoan parasite belonging to the Plasmodium family and is usually transmitted by the bite of the Anopheles mosquito or by an infected needle or transfusion. 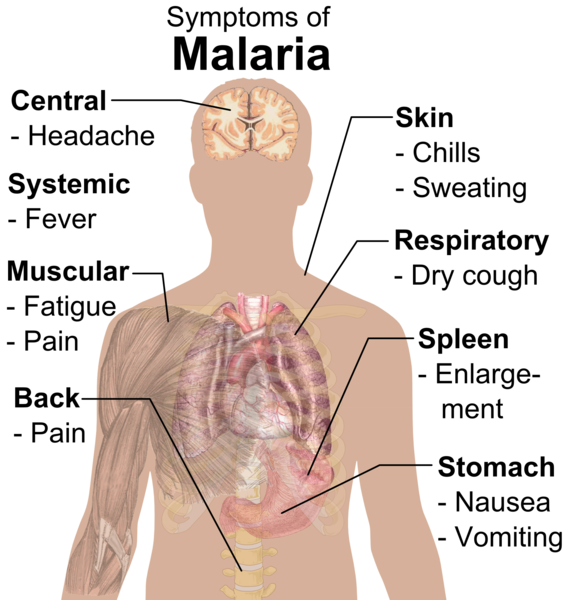 Dengue is a mosquito-borne viral infection. The infection results in flu like fever and illness, and at regular intervals of time, develops into a conceivably fatal complication known as severe dengue. The global incidence of dengue has grown dramatically in recent decades. Dengue is a weakness causing viral disease of the tropics, caused by mosquitoes, and results in sudden fever and acute pains in the joints. Malarial fever is transmitted by the bite of a female anopheles mosquito. The fever can only spread by the bite of the mosquito unlike dengue. The malarial mosquito usually becomes active and bites during the night. Dengue is diffused by an infected Aedes aegypti mosquito bite. It can be further spread if another mosquito attacks the infected person and then spreads it to some other people. The mosquito attacks during the day time. Widespread in Sub Saharan Africa. However, Asia and Latin America are also affected. To a lesser extent, some parts of Europe and Middle East are also impacted. The location is predominantly rural. Widespread in tropical and subtropical regions. It is endemic in more than hundred nations in Africa, Eastern Mediterranean and the Americas, Western Pacific and South –East Asia. The location is predominantly urban. These include Plasmodium Vivax, Plasmodium Malaria, Plasmodium Ovale, Plasmodium Falciparum, and Plasmodium Knowlesi. Dengue is an acute fever causing disease caused by the viruses transmitted by Aedes mosquito the dengue viruses i.e. DENVs, consist of 4 serotypes (DENV 1 to 4), which are members of the flaviviridae family, genus flavivirus. All 4 DENV serotypes have surfaced from sylvatic strains in the forests of South-Eastern part of Asia. Typically, ten to fifteen days after being bitten by the mosquito. The incubation period ranges from three to fourteen days after the infected mosquito bites, with an average of four to seven days. Mosquito vector, needle stick, transfusion. Fevers (periodic), headache, chills, vomiting, dry cough, spleen enlargement, sweating, faints, jaundice, hepatomegaly, splenomegaly, anorexia (eating disorder characterized by low weight). 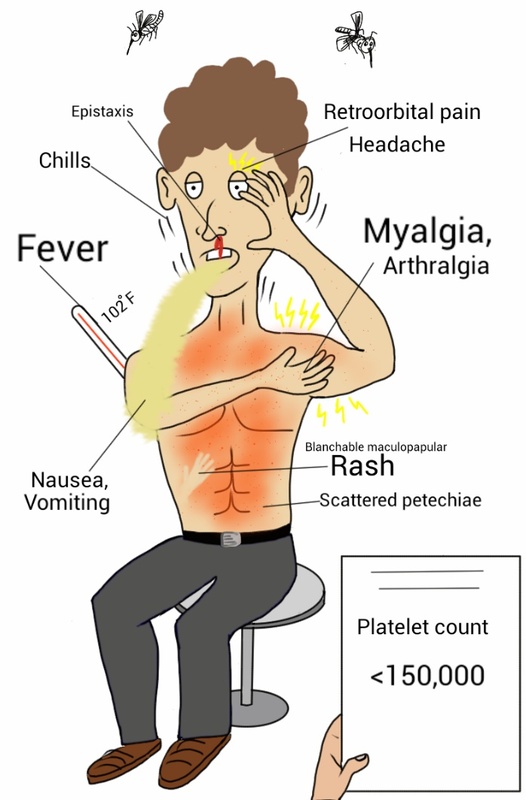 Sudden fever (390 to 400C), headache, fatigue, low white cell count, prostration, itching, retro orbital pain, skin maculopapular rash, moderate joint pain (ankles, knees, elbows), swollen glands, and rashes on upper and lower limbs, severe itching, enlarged lymph nodes, burning eyes, loss of appetite and taste, epistaxis (nose bleeding), blood in faeces and stool, bleeding gums. The fever sometimes vanishes and then recurrence takes place along with skin redness and rashes. No vaccines available. However, antimalarial drugs are available. It is better to protect and safeguard yourself against mosquito bites. No vaccine is available. However, to be safe, just avoid mosquito bites. Acetaminophen, Tylenol, etc can bring down dengue pain and reduce fever. Adequate fluid intake is recommended. Cerebral malaria i.e. malarial infection reaches the brain accompanied by seizures, confusion, and excessive fatigue tiredness leading to coma and even death. Water retention in the lungs (pulmonary edema). Aplastic anaemia (When body stops producing enough new blood cells). Decrease in WBCs i.e. white blood cells. Altered blood chemistry, including low sodium and lowered pH (lactic acidosis). “Blackwater fever” (tearing down of RBCs i.e. red blood cells, that causes dark-coloured urine). It is serious when condition progresses to dengue haemorrhagic fever. Bruises and blood spots beneath the skin may be present and pneumonia and swelling of the heart may happen. Dengue haemorrhagic fever is a serious health condition that could be fatal and results in death of 5% of the infected people. Dr. Amita Fotedar -Dr. "Difference Between Malaria and Dengue." DifferenceBetween.net. November 8, 2018 < http://www.differencebetween.net/science/health/difference-between-malaria-and-dengue/ >. Ayub, M., Sami, A., Saeed, M., & Khursheed, K. (2015). Dengue & malaria global burden: A cross sectional study of awareness & practice of dengue and malaria & its difference among different age group in Pakistan. JMR, 1(2), 55-58. Kotepui, M., PhunPhuech, B., Phiwklam, N., & Uthaisar, K. (2017). Differentiating between dengue fever and malaria using hematological parameters in endemic areas of Thailand. Infectious diseases of poverty, 6(1), 27. Magalhães, B. M., Siqueira, A. M., Alexandre, M. A., Souza, M. S., Gimaque, J. B., Bastos, M. S., ... & Mourão, M. P. (2014). P. vivax malaria and dengue fever co-infection: a cross-sectional study in the Brazilian Amazon. PLoS neglected tropical diseases, 8(10), e3239.